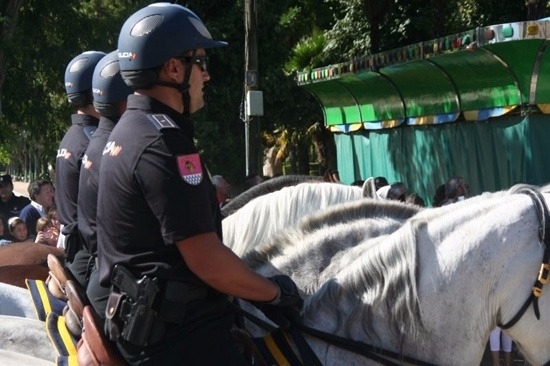 This Wednesday, July 5, was the presentation of the Cavalry Unit of the Spanish National Police that was displaced this summer to Operation Lumes 2017 at the International Center of Reception to the Pilgrim of Santiago de Compostela; A device of 15 agents and 12 horses that one year will be in charge of reinforcing security in the Camino de Santiago and to pay attention to the pilgrims who need it. The presentation was attended by the Vice President of the Xunta de Galicia, Alfonso Rueda and the Government delegate in Galicia, Santiago Villanueva, accompanied by the Chief of Police, Manuel Vázquez; The director of Tourism of Galicia, Nava Castro and the Dean of Santiago Cathedral, Segundo Pérez. The Cavalry Unit, which will be based in Pontevedra and Santiago, provides a very appreciated service in Operation Lemos, being able to access places that by other means is not possible. This police unit is coordinated by the Integrated Fire Prevention Committee (CIPIG), which monitors the care and monitoring of the Galician mountains, with the collaboration of the National Police, the Civil Guard and the National Police. Autonomous Police, contributing the work of up to 260 agents throughout this operation. This device is part of the Forest Fire Prevention and Prevention Plan of Galicia (Pladiga), which this summer will mobilize up to 7,000 people, 23 helicopters, five aircraft and 360 motor pumps with the aim of fighting fires in the autonomous community.